The soccer field was too wet for a game, but it was good for fishing! That guy knows his bench time is limited. 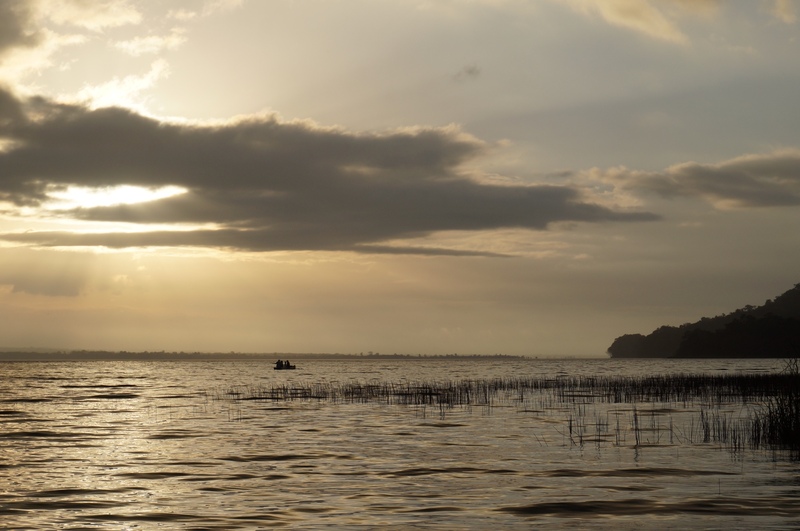 Sunset over Lago Petén Itzá. 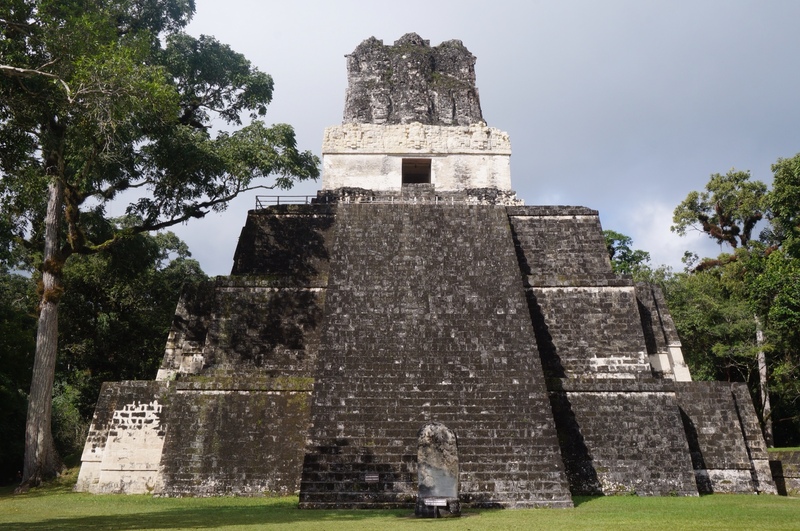 In the morning we hopped on a colectivo bound for Tikal. 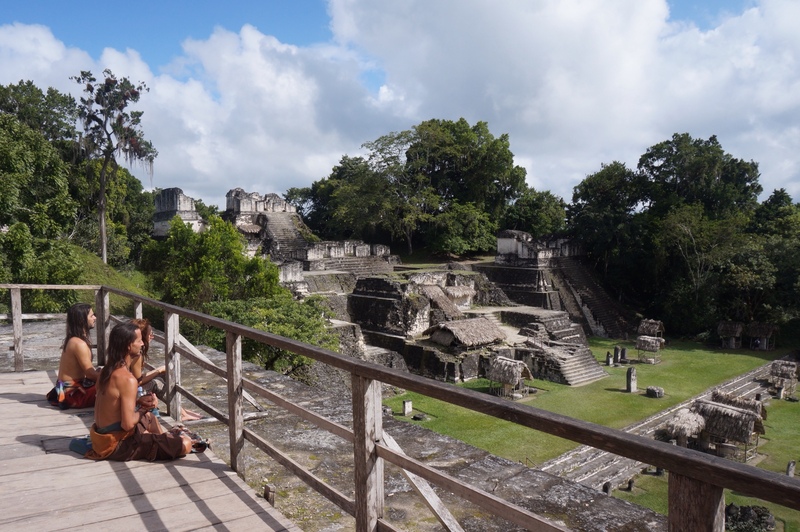 Yes, that Tikal, the crown jewel of the Mayan empire! Unfortunately we were surrounded by a bunch of now-familiar faux hippies intent on injecting some new age spirtuality into our bus ride. One of them, who went by the creative name of Bear, loudly talked to no one in particular about his life philosophy and how his family hasn’t understood his lifestyle ever since he dropped out of high school. Then he went into a long monologue about making flutes, whose flutey tunes he demonstrated at length for the enjoyment of all of the other people on the bus. While this was going on, the only thing I felt was pity for Bear’s poor parents. 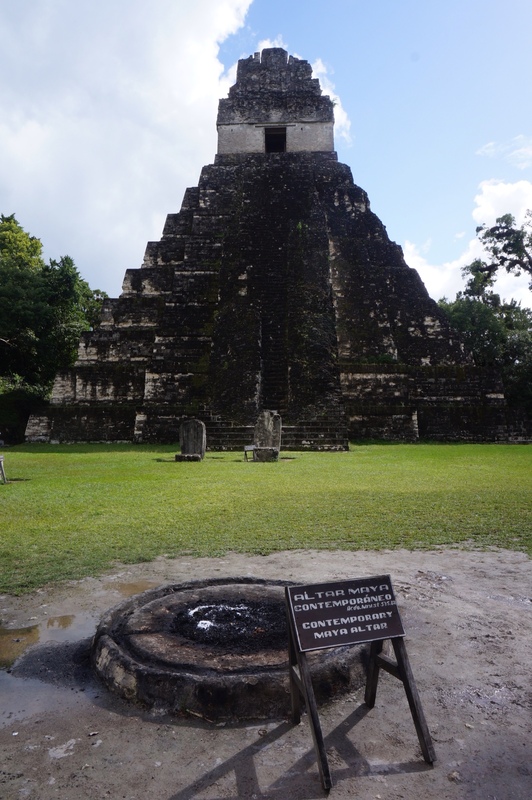 Having survived that interlude with our ears intact we finally made it to Tikal. This was to be our ultimate ruin visit for some time and we wanted to go out with a bang. (There was also a little teeny tiny part of us that was happy to be done with ruins for awhile…). But what better way wrap up our epic ruins tour than with the most impressive of them all? 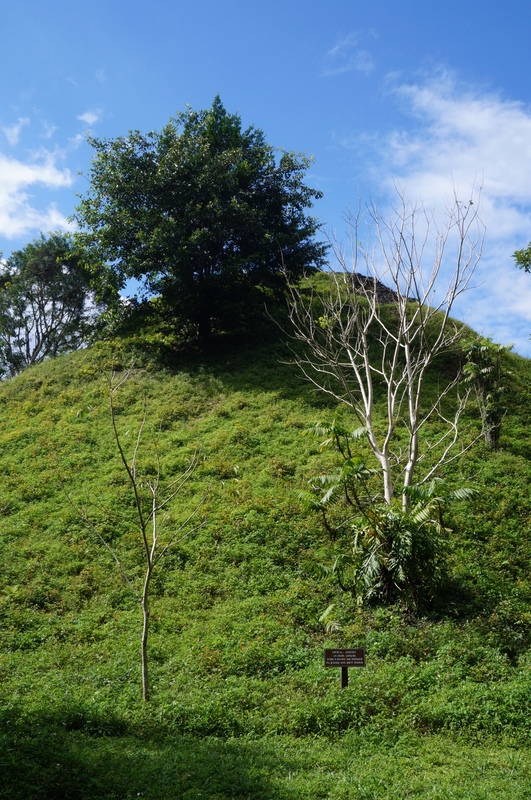 Ancient Mayan altars are slightly more impressive than contemporary Mayan altars. Bear & Co. thanking the spirit of Great King Jaguar Paw and waiting for the mushrooms to kick in. What an unexcavated temple looks like. Can’t complain about that view! After soaking up all that Tikal had to offer, it was back on the bikes for us. Days of fun and and engaging riding followed, even though most of our inital route plans were foiled. And here’s why: while on a map Guatemala looks fairly well connected, the reality is that a good number of those beckoning roads are loose-packed dirt and gravel, have been destroyed by landslides and earthquakes, or force you to pull out your climbing gear to pass summits of more than 10,000 feet. (Note from Alex: Actually, most of them are a combination of at least two of the above.) Great on a lightweight mountain bike, not so good on a loaded touring bike. None of the maps we could get our hands on reflected realistic road conditions, and so only frequent and often contradictory conversations with the locals revealed which roads were passable and which were not. If you want to take a dip, this puddle’s as good as any swimming hole. But as I said, we still had fun on our way south for the next days. 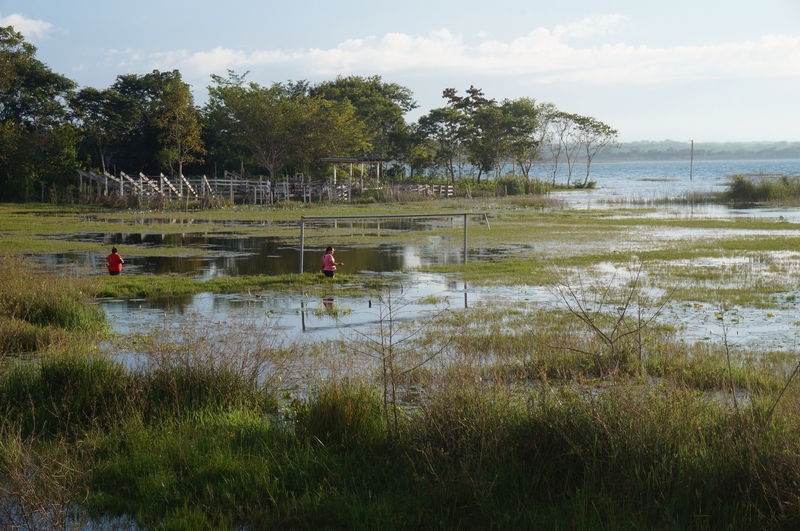 The tourist hotspot of Flores, also located at Lago Petén Itzá, had a lot going for itself in terms of scenery. 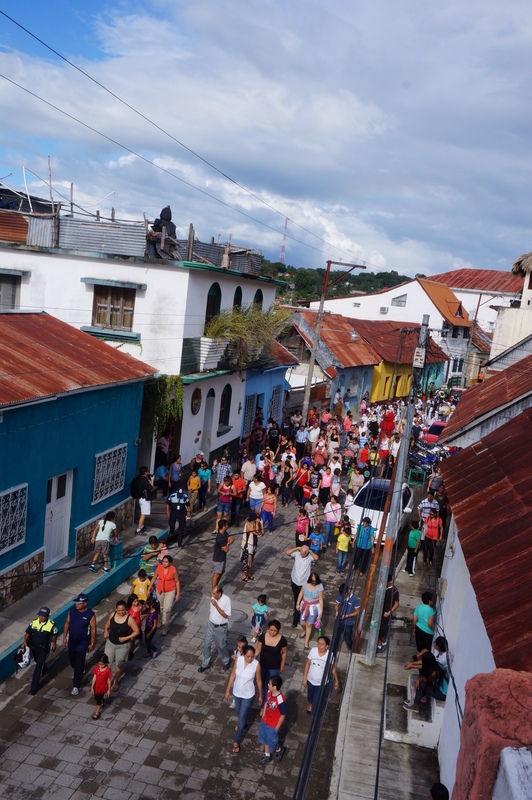 The island town is a big jumble of colorful buildings crammed onto narrow streets, with an unforgivably steep hill marking the town’s center. 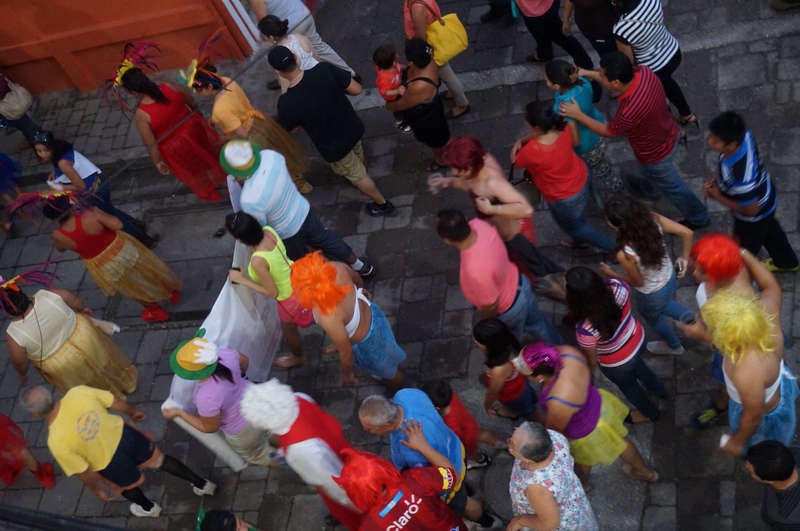 The night we spent there also happened to be the eve of a crazy festival with endless fireworks, people parading around the streets carrying large figurines, and really drunk men dressed in drag. We’re still puzzled over the inspiration for the madness. 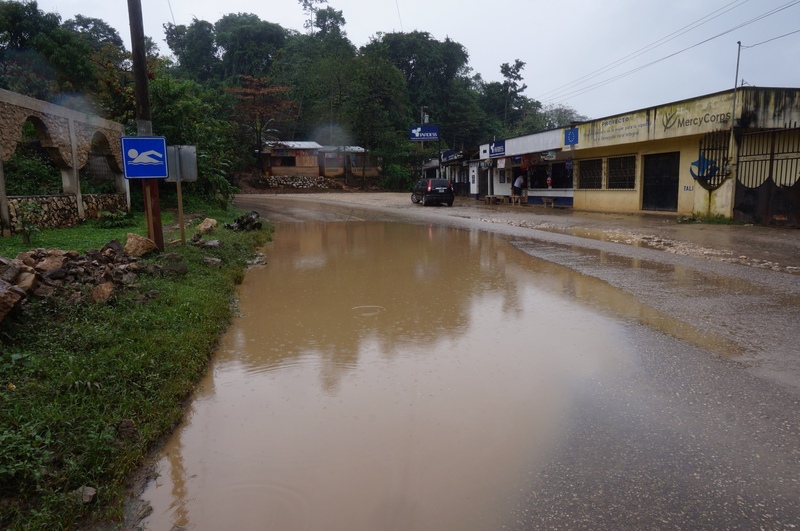 After Flores came Sayaxché, a city where the highway was unapologetically interrupted by a big old lazy river. Whereas in most countries a highway would cross a river via a bridge, in Guatemala there’s a ferry for that. 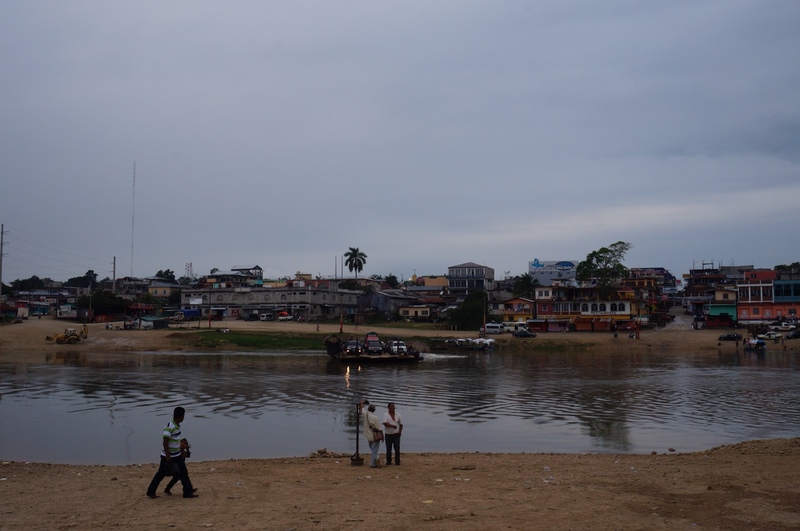 The ferry (read: barge) propelled trucks, cows, and the occasional cyclist across the river day in and day out. This being Guatemala, it did so with a bunch of tiny motor boat engines precariously affixed to the side of the boat and rigged to rotate as needed. An interesting feat of engineering to say the least! Raxrujá, yet another barely visible blip on the map, marked our next destination. On our way there we started to notice a stranger phenomenon. 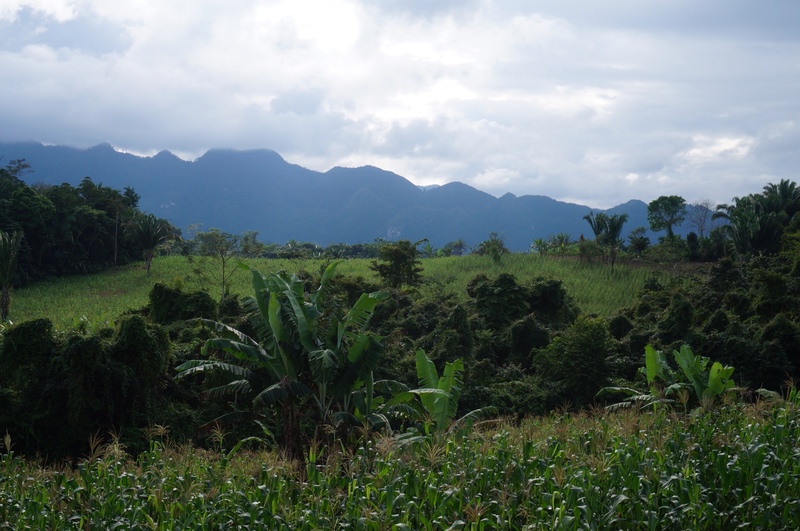 Every time we passed a small village along the road, we would hear excited shrieks of “GRINGO! GRINGO!” from first one tiny child, then another, until before we knew it dozens of children had run out of their houses and spilled out onto the road to stare and point gleefully after us. The GRINGO! call would build like the wave, to the point where the kids at the end of the road knew we were coming way before we got there. We never got called gringos in Mexico, so the fact that our gringo status kicked in in the middle of rural Guatemala was kind of a surprise. While the term is supposedly an offensive one, these little tiny kids are too young to know any better and we’re usually too tired to care. They’re simply excited to see some foreign looking folks crossing their town, so we match their eagerness with lots of waving and big smiles on our faces. (Though after one kid screamed “GOPRO! GOPRO!” after us, we were certain that we weren’t the first gringo bikers that had whizzed by.) Oh, what a wonderful world! Note from Alex: Up until Raxrujá we had it pretty easy. Apart from the occasional ups and downs the riding was fairly flat, the air was cool, and the whole thing was set against a beautiful alpine backdrop. On our way out of Raxrujá we even politely declined a free ride offered by a passing truck driver, so content were we with the gently rolling landscape and lush jungle greenery. 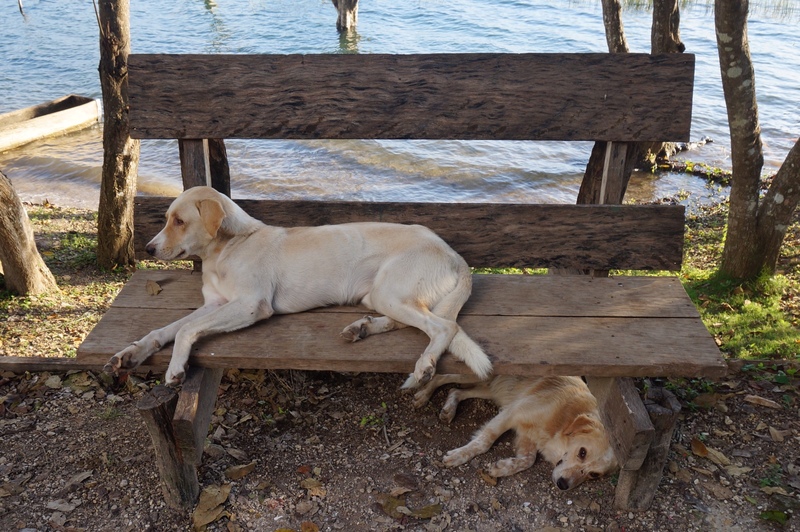 But let’s get straight to the point: Guatemala isn’t for sissies. 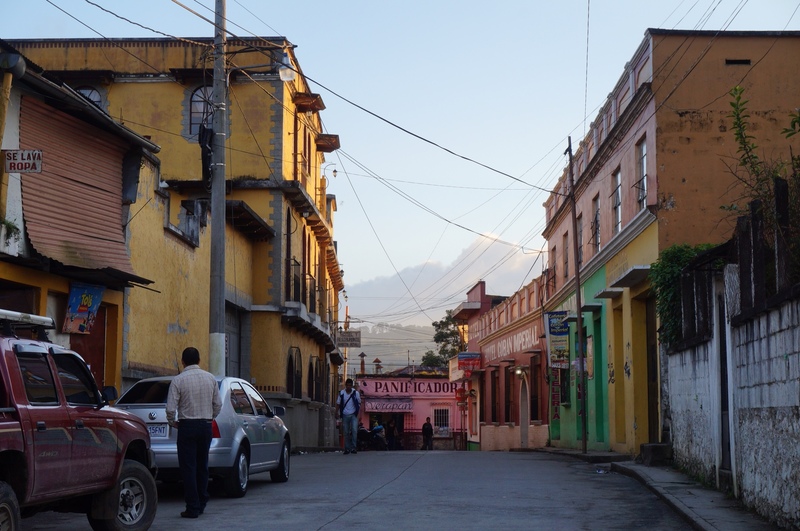 On the few occasions when we’ve asked other cyclists about their time in Guatemala, we invariably get answers like “it was hard” or “it was steep” or just a grunt and a shudder. 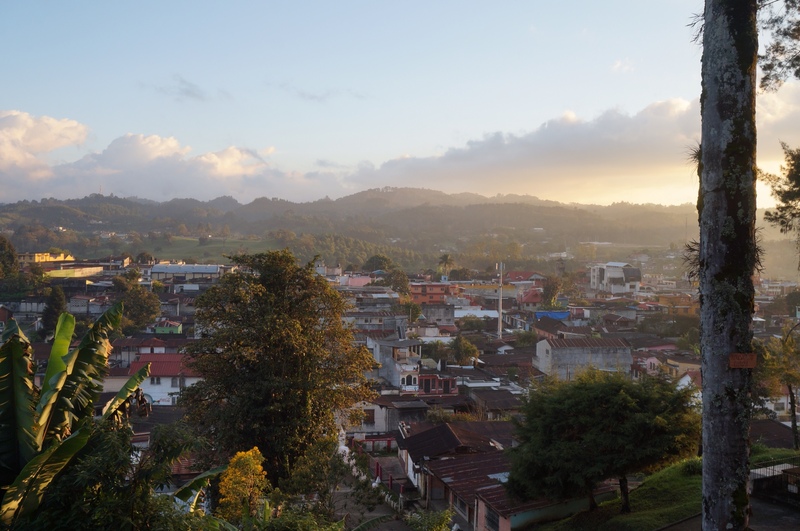 For awhile we thought we were above all that, but then we met the real Guatemala. Steep, indeed. Not long after declining that fateful ride we realized that the nice alpine backdrop was starting to become a close-up. Massive climbs with unforgivable grades of upwards of 20% soon forced us off our bikes. After the first, which took us up 1000 feet over the course of a mile, the sweat was running and our nerves were fraying. (Note from Alex: Mom, that’s three times steeper than Baker Hill). Faced with the prospect of more pushing than ever before, we developed a new technique. We would both start pushing our bikes next to each other, but with my long limbs I’d eventually take the lead and get a couple hundred feet ahead of Alex. Then I’d drop my bike, run down the hill, grab Alex’s bike and start pushing that beast uphill to give Alex some walking relief. I’d push it past where I dropped my bike, drop hers a good bit ahead, run back to my own bike (in which time Alex should have caught up to hers) and catch up with Alex again with my bicycle in tow. Then we’d repeat the whole process all over again. It’s pretty much playing leap frog with yourself. By the time it started to get dark we reached Cubilhuitz, yet another teeny-tiny town, and we were more than ready to call it a day. 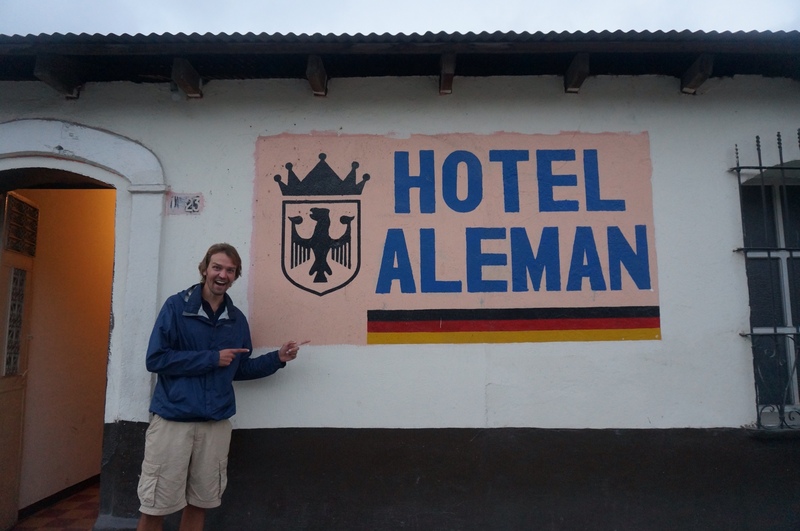 However, this was not to be, as the town’s only “hotel” (I hesitate to call it that) was of more than questionable quality. Of all the grungy places we’ve stayed at nothing even comes close to what those rooms were like. Imagine a dark, crammed wooden shed with a single bed (no mattress, no pillows, only an old grimey horse blanket loosely draped on top), no windows, the ceiling leaking, the moldy wallpaper peeling off, thumbsized cockroaches flitting around the floor. Add to that a multiple layers of spiderwebs in each and every nook and cranny, and you get an idea what this place was like. Long story short, we decided against staying there. Instead we got lucky and found a spot on one of the many colectivos rushing towards Cobán, a town located hundreds more feet of seemingly vertical climbing ahead. While Mexico had done a great job of pampering us with large, fancy tour buses, Guatemala specializes in the kind of van that’s normally built to carry nine, maybe ten people. That, however, doesn’t stop Guatemalans from packing 25 people in there, with two extra people sitting on top, one hanging from the side and, oh did I mention, our two bikes and multiple bags all mounted on the roof. 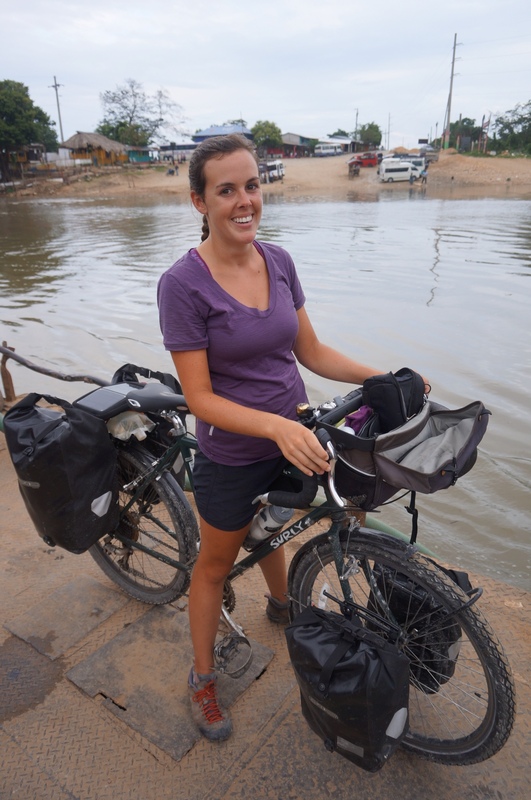 (Note from Alex: They got 37 people in on my last trip to Guatemala. I’ve yet to see that topped.) Alex sat on a water jug propped between two seats, I sat in the aisle space between another two seats. We pretty much all sat on top of each other. Good thing neither of us has any problems getting cozy with the locals. 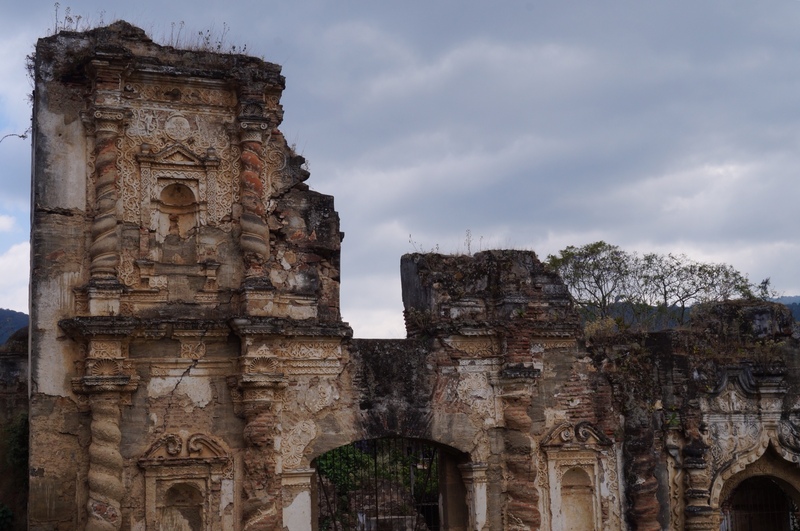 Unbeknownst to us, Cobán has a long history of German settlement. Wunderbar! Cobán was a nice surprise. 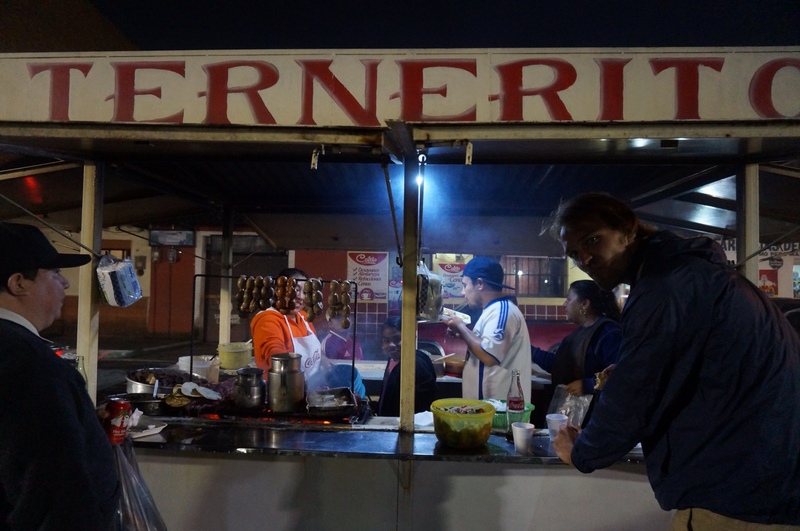 As a city that we hadn’t spent much thought on beforehand, it really exceeded our expectations, covering everything from a great budget hotel to cheap and plentiful street food, all within a relaxed mountain town atmosphere somewhat reminiscent of San Cristobal de las Casas. We could have easily stayed longer, given the chill vibe. It was so chill that we basically did nothing when we were there, apart from eat and catch up with friends and family from afar. 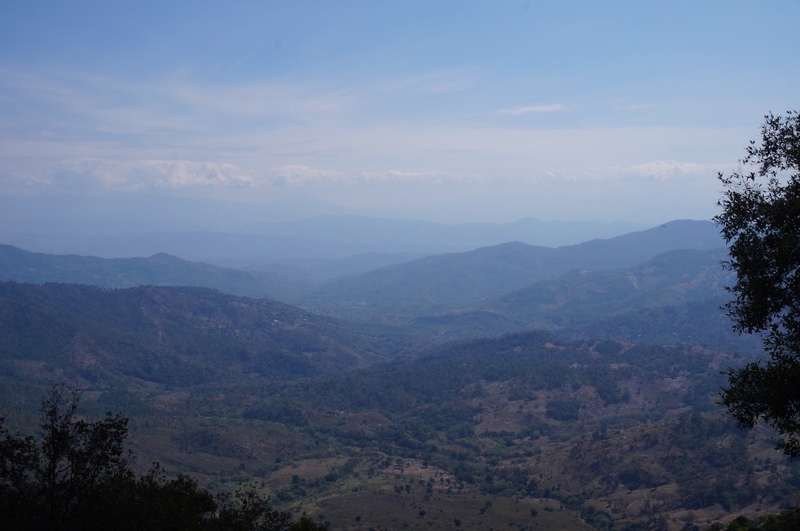 Cobán was also where we first spotted the mysterious scarfman. Who’s that you’re asking? Well, the mysterious scarfman is a tall, leather-skinned silver fox wearing black jeans, a black longsleeve and a fashionable red checkered scarf artfully draped around his neck. This was not last we would see (or hear) of him, so stay tuned for the next post to find out more. When the bakery is but a stone’s throw away, you know you’ve found the right hotel. 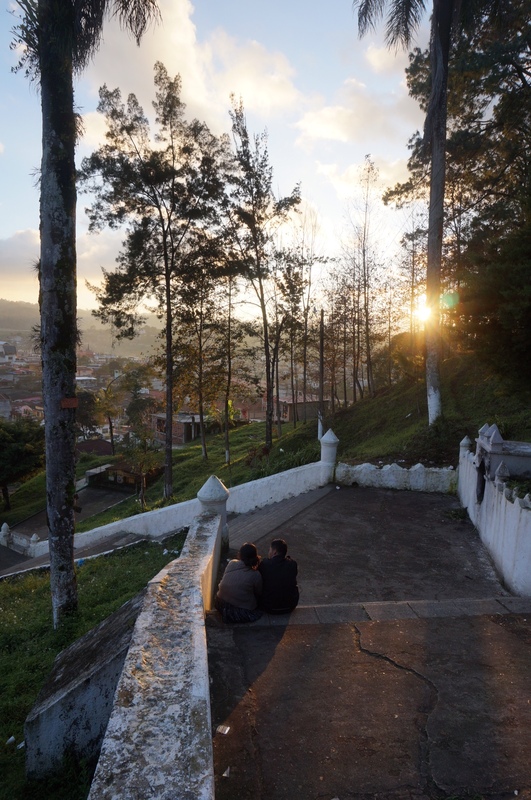 Sunset over Cobán from Templo El Calvario. We convinced ourselves that the staircase to the top constituted exercise. Tom on dinner #3 at our favorite food stand in Cobán. Scenic backdrop mountains becoming close-up painful mountains. Maybe there’s a quetzal somewhere out there? At this point we had to make another crucial point call. 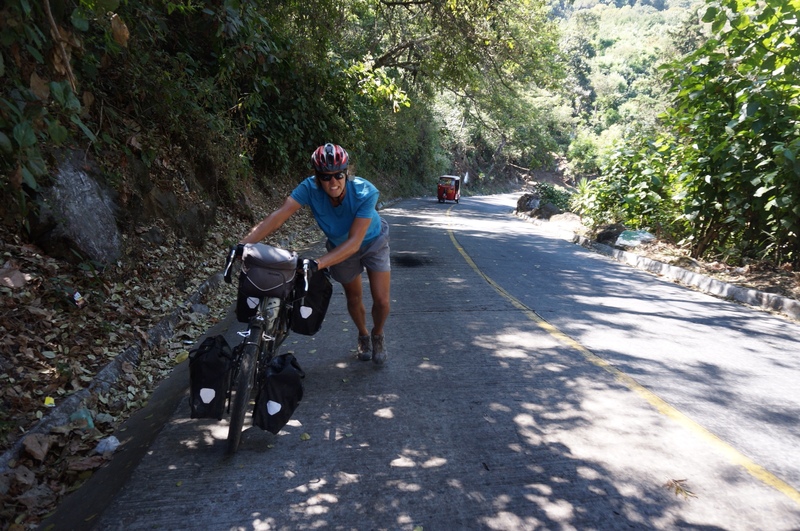 Did we really want to make the ride back up the mountains towards Guatemala City on one of the busiest, nastiest highways of the country… on our bikes? Or did we want to skip that unpleasant stretch by boarding another bus? One look at the road had us quickly swinging towards option number two. This time around we even got to ride on an actual bus, with actual seats! With our bikes secured on top we rushed towards Guatemala City, all the while staring out the window and finding out that not riding our bikes along this highway was the best idea we’ve had in ages. The ride was hot, bleak, and desolate, and the road was under construction (AKA a big dusty dirty mess) for long stretches of the route. Add to that 5000 feet of climbing and a car accident that held up the whole shebang for almost an hour and really pissed off all of the drivers on the road, and now you understand why we were happy as clams in our comfy bus seats. In Guatemala City a friendly, one-legged guy with a truck drove us from the bus station we were dropped off at to the bus station we needed to be at. Alex rode shotgun and I sat on the truck bed with our bikes, enjoying our unofficial 45 minute tour of Guatemala City. Turns out that was more than we needed to see of the capital and its chaotic infrastructure, suicidal drivers, and seemingly nonexistent traffic rules. Quite the non-sight if there ever was one! While I enjoyed the sounds and smells of the tour (honking horns, clouds of diesel fumes), Alex got the commentary portion from our trusty chauffeur, the highlight of which was driving by the soccer field where he scored his last goal twenty years ago before losing his goal-scoring leg two weeks later. From the western end of town we caught our third and final ride of the day, this time on a big red chicken bus, and headed for Antigua. 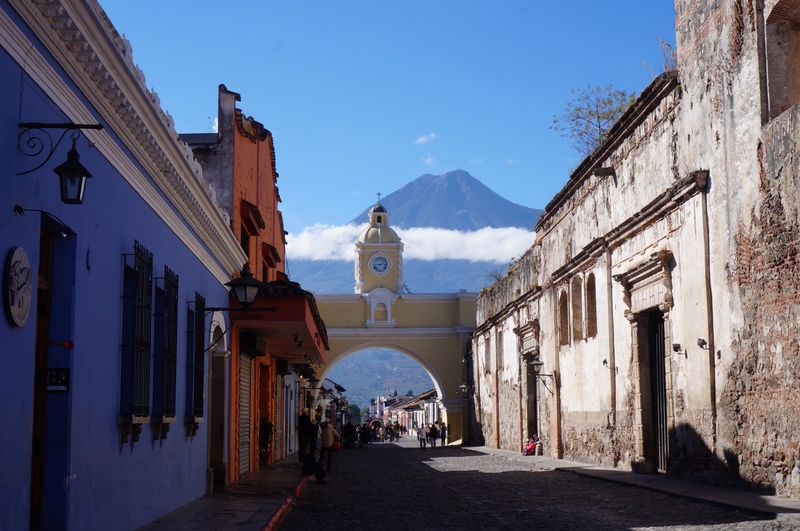 If you didn’t know (and I certainly didn’t beforehand) Antigua seems to be the go-to place to be for foreigners visiting Guatemala. Perhaps this makes sense, given that it’s close to the Guatemala City airport yet a world away from the busy, unpleasant sprawl of the capital. Picturesque Antigua sits in the shadow of some mightily imprssive volcanoes, and despite its roaring tourism industry manages to retain a small town feel. While the downtown center is more manicured and correspondingly pricey than our wallets could manage, the cobblestoned outskirts just a few streets away are a world apart from the eco-boutiques and ever-popular Subway sandwich storefronts. (Seriously though, you would be shocked at how many tourists choose to eat their meals at the Antigua Subway.) And though we’ve vowed to never cross the threshhold of a Subway while in a foreign country, we still might sneak a few french fries here and there. Just so we don’t forget what they taste like. Every city should look this good. Even the crumbling bits are pretty. As for these Volvo-driving Oregonians, who are you and why are you following us? Hallo ihr Zwei,viele Grüße zum Wochenende sendet Euch Klaus-Dieter von der TOM SAWYER. Leider habe ich erst nach sieben langen Monaten entdeckt,dass wenn ich eure Seite auf dem Handy aufmache, mir sofort eine Übersetzung angeboten wird.Das erleichtert bei den doch nicht so perfekten Englischkenntnissen meinerseits, Einiges. Deshalb habe ich in der Vergangenheit mehr eure wunderbaren Fotos als den Text beachtet, als es eigentlich von Nöten gewesen wäre. Aber das will ich nun ändern und werde eure Reise noch einmal Schritt für Schritt verfolgen. Allerdings hatte das Übersetzungsprogramm arge Schwierigkeiten,den letzten Text eurer Mom zu übersetzen. Viele Erinnerungen verbinden sich für mich mit euren Fotos, da ich zu richtigen Seefahrtszeiten fast ausschließlich in Mittel und Südamerika war.Meistens waren es nur die Hafenstädte, die wir zu sehen bekamen,aber in Nikaragua hat man uns an einem Tag fast durch das halbe Land gefahren. Und so wünsche ich euch weiterhin viel Spass auf euren Unternehmungen und tolle Erlebnisse vor allem mit den Menschen und verabschiede mich auch im Namen meiner Frau, die vor drei Wochen aus der Antarktis zurückgekehrt ist. Sie fährt noch richtig zur See, wir betreiben hier eher Nahverkehr. Hallo Klaus-Dieter, danke für die Grüße. Wir sind immer froh, Feedback zu erhalten und ich hoffe, dass dir die Übersetzung hilft, den Blog mehr zu genießen. Alles Gute von Tom & Alex! Enjoying reading along with you on your adventures. You are my idols! 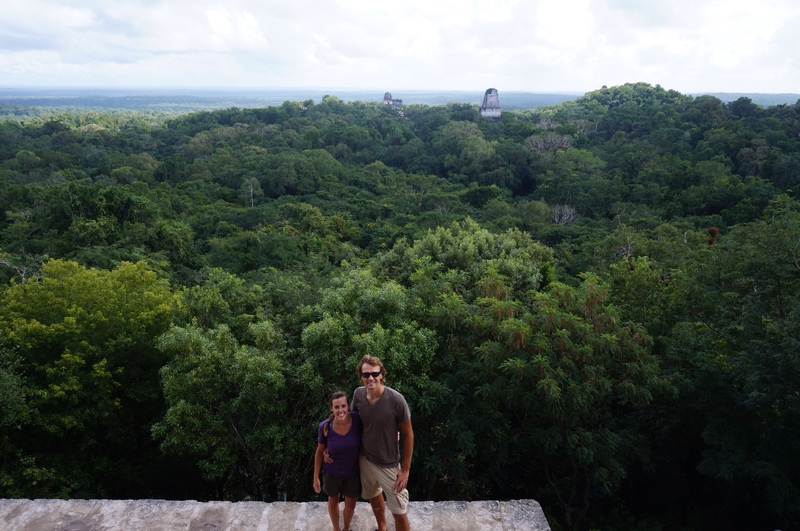 We just spent 3 weeks in the Yucatan–missed Belize and maybe that’s a good thing. Thanks for sharing….publish this and finance your next trip. Thanks for reading Steph! So glad you guys had fun in the Yucatan – I hope the marg count was high. Sending lots of hugs to the Crystal Springs crew, and missing you all! 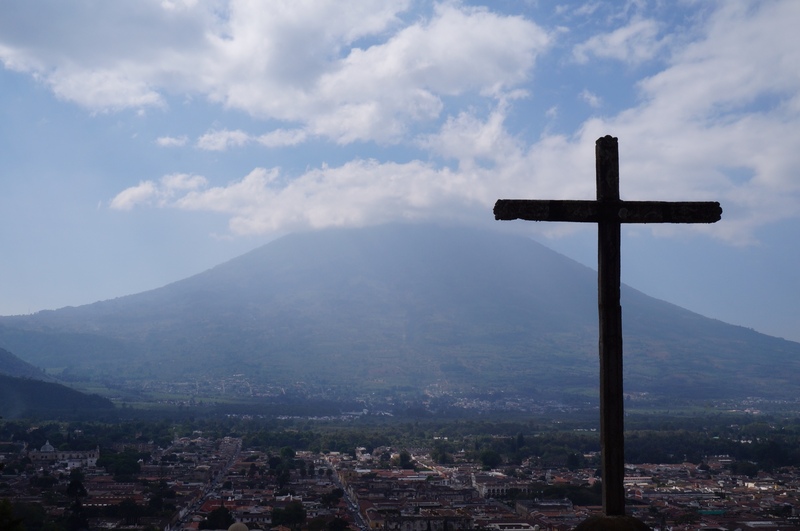 Wow, Guatemala – stunning! What’s the food like there? I hope people are nice to you! And I’m guessing that a big reason for writing all of this is to help you remember everything years down the road, but how lucky are the rest of us to read it?!? Thanks for taking the time to keep us all in the loop! Rock on.